Running for Fun: Yuck - more snow! 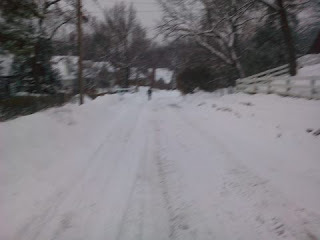 I know this picture is blurry, but you'll get an idea of how the roads were on Saturday morning. I arrived at 6:40 for the 6:45 am departure time. From our running group postings, I thought we would have a nice small group at 6:45 for the first 7 miles before meeting with the Capital Striders' group at 8 am for the remaining 7 or 8 miles. Well at 6:44, I was the only one in the parking lot, and the world's greatest minivan pulled up next to my VUE. John hops out of the van ready to go and says "It's just us till 8 - everyone else bailed (because of the weather)." Yuck - the day before we had received another 3-4 inches of the powered stuff - and this was really made the roads more of a sand like consistency. We tried to imagine running on the beach for about 3 seconds, than realized if we were running on the beach we wouldn't be wearing stocking caps, mittens, and 10lbs of other running clothes. I'm ready for this to be over! Bring on the 90 degree heat instead of the snow!!! My ankle seems to be healing fine and I'm pretty much back to normal running. I went a little hard this week, likely in response to being mad about missing the race last week. Wednesday - TEMPO run - 7.5 miles - 30 minutes at 6:50 - 7 min mile pace with 3 miles of warm up and cool down. Yes, outside on the ice. Thursday - 8 miles on the treadmill just under an hour. Saturday - 2:15 about 15 miles. See pic above for explanation about slower pace. I know I have posted much about nutrition lately - basically, I get hungry and start eating so fast that I forget to take a picture. 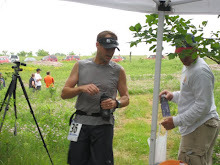 It's all training for Ice Age....or is it Trail Mix?